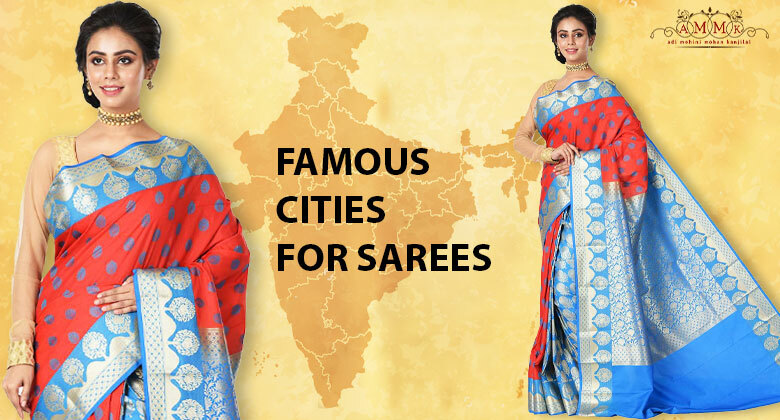 Which are the famous cities for sarees in India? Saree is one of the world’s oldest and perhaps the only surviving unstitched attire from ancient time till now. Mesopotamian civilization invented the art of weaving fabric from cotton and India inherited it from them. Silk fabric came from China and adopted by the Indians later as per history. Many new designs and techniques of weaving, dyeing, and printing came to India with the repeated invasion of different clans and got circulated in many cities all over the country. Some of these cities and their famous sarees will be discussed here. Kolkata, the city in West Bengal sometimes quoted as the cultural capital of India which is very famous for its traditional Bengali sarees all over India. Weaving, texture, color, and material make these sarees lovable for everybody. Baluchari silk is a Kolkata saree which depicts scenes from mythology on its border and pallu. Gorgeous Garad or Kantha Stitched Silk sarees are also there for you to use on special occasions. If silk fabric is your preference then go for Bishnupuri, Murshidabad or Tussar Silk Sarees. Dhakai Jamdani is another Kolkata saree which is considered as one of the finest Muslin textiles of West Bengal. Kolkata city will surely bring a happy experience for you when you there for shopping. Adi Mohini Mohan Kanjilal has a huge stock of all these sarees to meet your expectation. Kanchipuram is a city in Tamil Nadu which is hailed as silk city as the main profession of the people living in and around is weaving silk sarees. More than 5000 Families are engaged in this industry. The silk weavers are settled here for more than 400 years giving the city a reputation as a producer of best silk sarees in India. Woven from pure Mulberry silk, these Kanchipuram sarees have dazzling colors, lovely designs, and enviable durability. Kanchipuram sarees are called Kanjivaramsaree also. Kanjivaram sarees are in abundance in the showroom of Adi Mohini Mohan kanjilal which will guide you to the right direction for your saree selection. Banaras is the city for ethnic Banarasi saree that has been ruling over the Indian market over the decades. They are highly valued for their intricate gold and silver zari work and lovely designs. These are heavy sarees and takes long time to be made by the artisans of Banaras. Persian and Indian designs are combined in this saree. This is one of the most chosen bridal sarees in India and worn in important festivals parties as well. You will find a vibrant stock of Banarasi sarees with Adi Mohini Mohan Kanjilal and you can pick up the right one for yourself. City of Kota in Rajasthan is the originating place for Kota Doria sarees, a very popular brand for Indian women. These are very lightweight sarees and very easy to drape also. Kota sarees are in square pattern which are known as khats. Pocket-friendly price range of Kota saree and its comfortable drape is appreciated by womenfolk of India where the duration of summer is for almost six months. Vast collection of kota sarees are waiting for you in the showroom of Adi Mohinimohan Kanjilal. you please be ready with your collection of Kota sarees to face the challenge of coming summer. With the limited scope here, only a few of the cities in India famous for sarees are quoted. But many are remaining unspoken which will be discussed later to answer your query.